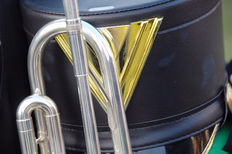 Viking Band rehearsals will take place every Monday, Tuesday and Thursday from 4:00pm - 7:00pm. These rehearsals are mandatory as they are an extension of the band class. Students are to come to rehearsal prepared to work outside. Please remember to dress appropriately (shorts, t-shirt, tennis shoes, socks, hat, sunglasses, sun screen). Students must always have their water bottles with them to help stay hydrated. Make sure to eat a healthy lunch during the day, and it is advised to have a light snack before rehearsal begins such as a protein/granola bar or a piece of fruit. Students and parents, please encourage one another to stay hydrated, eat a healthy, and come prepared to work! Below is a list of our uniform requirements for each performing ensemble. All students are responsible for purchasing these items for performance purposes.